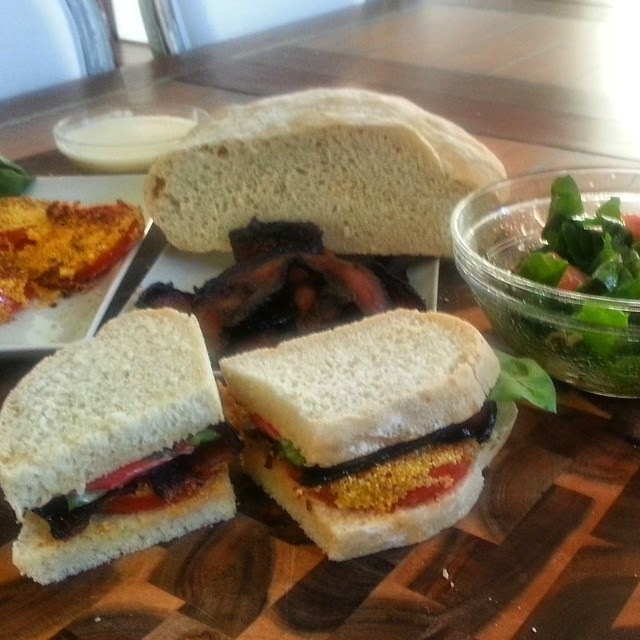 I will never make another regular BLT again. In a mixer, combine 1 3/4 cup hot water and 2 cups flour and start to mix. While mixing, add 2 teaspoons salt and 4 1/2 tsps yeast. Add 1/4 cup of flour at a time until you reach 4 cups. Switch to dough hook and put on high speed for 25 minutes. It will sound and look like craziness. Your mixer will dance across your countertops. Continue to do this. Once 25 minutes is up, scrape down the sides of the bowl, cover with plastic wrap and let rise 2-3 hours, at room temp, til it triples in volume. To shape, gently scrape the dough onto a pizza stone with corn meal sprinkled on it, or a greased pan, and tuck the edges under- it's a vague football-esque shape. ish. sprinkle the dough with flour and cover with a dish towel for an hour until it's very puffy. Preheat oven to 400 degrees (350 if you're using a convection oven) 20 minutes prior to baking. Bake on center shelf until golden brown, about 50 minutes. to be certain it's done, turn the loaf over and it should sound hollow and hard when thumped. Then eat it. Hot out of the oven. because THERE IS NOTHING ON THIS EARTH BETTER THAN FRESH BAKED BREAD OUT OF THE OVEN. For the salad, I simply cut up some chard, cut up some chunks of grapefruit, and made the dressing using some fresh mint, parsley, and cilantro, lemon juice, a little grapefruit juice, evoo and salt and pepper.